Perdica 1st is the first ancient Macedonian king. He established the Ancient Macedonian Kingdom in 729 B.C. For capital of his kingdom he choose the small town of Ayga, located highly in the mountains, on the lower part of the river Bistrica (Halijakmon). West of the town there were located higher mountains which attracted rain. Perdica 1st was a great king a leader. He enlarged the territory of Macedonia than in was in the old times. Perdica 1st started the Macedonian - Illyrian wars. He was king until 678 B.C. Argeius, is the second Macedonian king. In the period of his authority he carried on with the Macedonian - Illyrian war. Philip 1st is the third Macedonian king. Not even he took part in that war, he was even killed there. Aerop, the 4th Macedonian king, ruled the country for 65 years. He was arrogant king, but also very powerful. And realized what the other before him didn't, he defeated the Illyrians. Aerop died and after his dead started a struggle for authority. In the period of his authority, Persia became the most powerful country. And as most powerful attempted to conquer land on the Balkan Peninsula. In the period of Greek - Persian wars, the Macedonian king Aminta 1st had to accept dependence of Persia. He confirmed that Persia is the most powerful country. Macedonia was improved into a strong and powerful kingdom in the period of Alexander 1st Philhellene. He was the first non-Greek that, took part in the Olympic games in Athens. But in the games nobody else than Greeks were allowed to play. The official Greek parole was: "No Barbarians are allowed". So he had to prove them that he is Argeean by origin, that he is from the neighborhood. So they let him to play but, they gave him an epithet Philhellene, which means not Greek. This epithet was given to all people that were no Greek by origin (not even related to them). Alexander 1st Philhellene is the first known Macedonian who took part in the Olympic games and won them. He also was excellent politician. He took part in the battle between Greece and Persia. And he used their business and conquered Thrace, which was wealthy with mine minerals. He was the son of Alexander 1st Philhellene, and spread an "friendly" politic. Perdica 2nd, formed public and secret alliances in dependence of state interests. He used the war among the democrats from Athens and aristocrats from Sparta. And he developed Macedonia, powerful than ever was and became important military power. 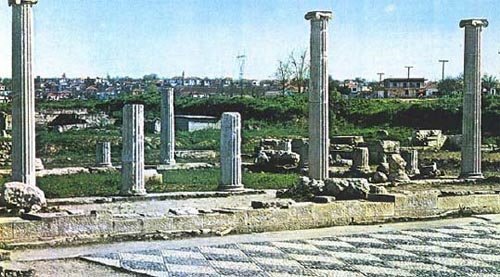 "Pella, the ancient Macedonian capital"
He paid attention mostly to the external politics and made important reforms in the country. For him all people mentioned, that he created more then all the kings before him. He built new towns, built roads, and made reforms in the army especially in the cavalry and it's armor. He moved the capital from Ayga to Pella. Pella had excellent geographical position. Pella was lying in the field of Salonica (but then Salonica didn't exist). And in Pella Arhelaius built big castle, designed by Greek architects. In this period started the Greek influence and spreading of the Greek culture in Ancient Macedonia. In the capital Pella, came a lot Greek cultural workers like the painter Evripid, the dramatist Zeuxis and a lot of others. Arhelaius 1st conquered Larissa in Thessaly. He established great relationship with Athens and started war with the Lynkests. But unfortunately, during the battle, he was killed. The murder of the King Arhelaius 1st, created unstable situation in Macedonia. For a short period several kings were assassinated. First Arhelaius 2nd (399-396), Orest (396-393), Aminta 2nd (393-392), Pausanius (392-392) and Aminta 3rd (392-369). He defeated the Illyrians again. Next king his son Alexander 2nd (369-368) was assassinated, during the first year being on the throne. The next kings Ptolomeius (368-365) and Perdica 3rd (365-360) were also murdered.